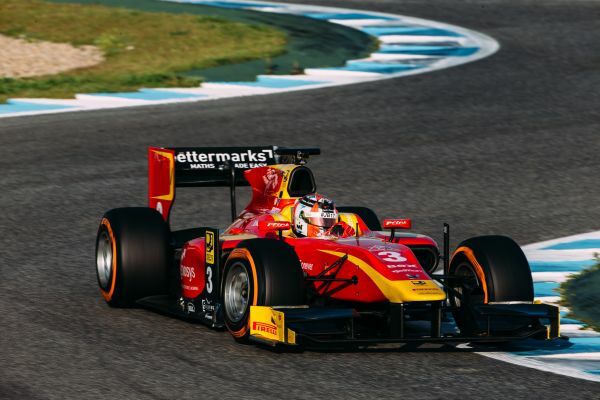 The final pre-season testing for the GP2 teams got underway at Jerez on Tuesday morning in cold and foggy conditions and as the visibility deteriorated practice was red flagged until the conditions improved. Once the session resumed the two Racing Engineering drivers, Norman Nato and Jordan King, were setting some very fast laps and with thirty minutes remaining Jordan went to the top of the timing screens with a lap of 1:26.201s and then, in the dying minutes, it was Norman’s turn to go fastest with a time of 1:25.811s. Jordan’s earlier lap was good enough to finish in third place. As the cars got underway for the three hour afternoon session the temperatures had improved and once again the Racing Engineering duo were amongst the fastest and after ninety minutes Norman was second on 1:26.558s with Jordan right behind in third with a lap of 1:26.607s. For the rest of the session both men concentrated on car set-up so they ! did not improve their times but they were still in third and fifth places at the end of the day. Wednesday, the second day of testing, saw the weather sunny but cool and once again the Racing Engineering drivers were setting the pace with Norman going fastest after thirty minutes with a time of 1:24.922s and then Jordan taking over the top spot with a 1:24.429s lap at the one hour mark. Three red flags interrupted the rest of the session and at the end of the three hours Jordan remained on top with his earlier time while Norman improved to 1:24.634s for 5th place. In the afternoon session the Racing Engineering team concentrated on running race simulations for both drivers as Jordan completed 72 laps and Norman 57 with neither man setting any fast laps. The weather was fine again on the final day of testing, Thursday, and for the third day Racing Engineering were quickest in the morning session with Norman setting a time of 1:24.518 s after twenty minutes which remained unbeaten for the three hour session that saw four red flag incidents. Jordan was just a little slower on 1:24.717s but such was the closeness of the times, with the top seventeen cars separated by less than one second, he was in 9th position. For the afternoon session the team was running race simulations so no quick laps were recorded but nobody could beat the fast times set previously by Jordan and Norman. The final pre-season testing at Jerez has been very important for the Racing Engineering team with either Jordan or Norman being fastest in the three morning sessions and they finished with the two fastest times recorded over the three days. In light of this performance both Jordan and Norman must be considered as strong contenders for the Drivers’ Championship while Racing Engineering are in a si! milar positions as regards the Team Championship. The team will now return to their Sanlucar de Barrameda base to prepare for the first race of the 2016 season which will be held at the Circuit de Barcelona on the 13th to 15th May. "Great job by everyone! Couldn't be happier with what the drivers achieved. But most importantly we have to remember that the whole team is behind these results. Both engineers and mechanics have not only worked nonstop to achieve these results, but also left no stone unturned in the quest to improve every hundredth of a second. Well done by the guys, but now they deserve some rest over the weekend." "The most important point of this test is that we were immediately there on the first day, which is important considering that during a race weekend there isn't much time to set up the car. This means we had a good preparation at the workshop and the car set up was good straight away. I am happy with these last few days as we were able to test everything we wanted before the first race of the season." "We managed to try a lot of things during these three days of testing and made good progress getting through everything that we hoped. It's good to see we were fast in short as well as long runs and I am therefore really excited for the first race in Barcelona."